This week on Spellburn we take a look at one of the system’s distinguishing features, the character funnel, in which many level zero peasants will meet their untimely demise. But with some luck, pluck, and and a few blows well-struck, a select few will gain the first glorious level of experience and become true dungeon-crawling adventurers. I always do 3d6 down the line…picking a character seems lame to me. I add story when you level up. Why is you farmer now an Elf? 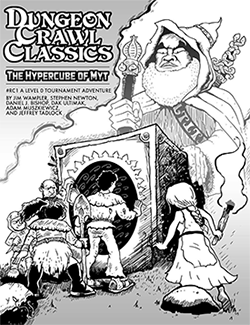 That pre-DCC RPG zero level adventure Jim mentioned is DCC #0 “Legends are Made, not Born” (http://www.goodman-games.com/5100preview.html). And for what it’s worth, my home-brew rule with 0 level characters is I actually roll them up with 1d4+2 hp. That way none of the funnel characters have just 1 or 2 hit points. That provides them a bit of chance to live (somtimes) through at least 1 hit by a monster or trap. I noticed that people took absolutely no interesting in a 1-hp character. I LOVE the party generator! I use it nearly every time I run a funnel. Thank you! Hey Guys, awesome ‘cast. I have only run 2 sessions of DCC (my first ever as DM in any RPG) so far but loving every minute. On the subject of 0 level – my guys survived ” Perils of the Sunken City” with a total of 5 characters, nearly all who had only 1 or 2 hp. As I had forgotten to let them burn luck during the adventure, I decided that at levelling up, the PC’s with 1 or 2 HP, could choose to roll their HD for their HP score, or if they preferred they could take half of the HD max, ie 5 if D10, 4 if D8, etc. In the end they all chose to roll the dice and all got average scores anyway. Our group had a great time when I ran them through Perils of the Sunken City! Glad you enjoyed Perils John! And thanks for the shoutout and links JudgeJeffrey, as always, much appreciated! My group was wondering since we ran portal under the starts for the first time playing DCC. Do the charachters get XP for encounters in the funnel ? so will the gain a level during the adventure? or is it not until they finish it that they gain 1st level. I just took the HQRPG link down! Uh, shoot. I guess I should put it back up? Put it back up! It’s pure genius as far as I’m concerned.